1. 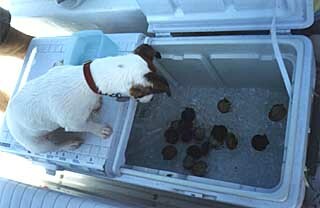 After you catch a bunch, place your scallops on ice. The cold causes them to open up. In contrast, warm scallops will demonstrate quite clearly the meaning of the English verb "to clam up!" 2. 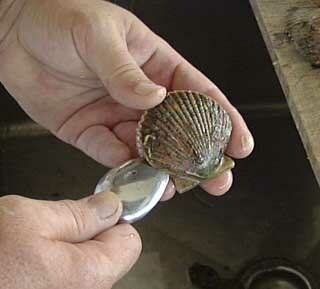 With the dark side of the scallop up, hinge facing away from you, insert a knife blade or sharpened spoon between the top and bottom shells from the right and cut away the muscle at its attachment to the top shell. 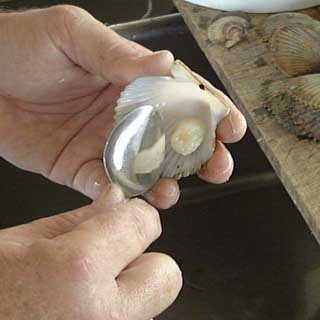 Remove the top shell and discard. 3. Remove the dark innards by gently scraping from hinge to front with a spoon or scallop knife. The innards will peel cleanly from the muscle if you carefully scrape over the muscle from hinge to front, pinching the innards to the knife or spoon with your thumb as you pass over the cut surface of the muscle. This will leave the clean muscle attached to the bottom shell. 4. 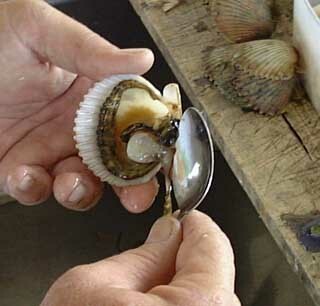 Now you simply scrape the scallop muscle from the bottom shell. Some people prefer to leave the muscle attached, put a drop of soy sauce on the meat, surround it with crabmeat stuffing, and broil it, shell and all . . . Yum! 5. 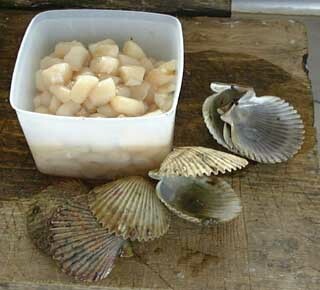 The limit for cleaned scallops is 1 pint per person with a maximum of 1/2 gallon per boat.